Photo #169. From left to right: Phagna Pheng Phongsavanh and H.E. 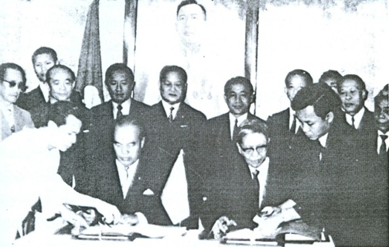 Phoumi Vongvichit signing the agreement to create the third coalition government in Vientiane in 1973. This was the last leftist plus rightist coalition government formed after the two factions reached an agreement. It was in office from June 1974 to December 2, 1975. In April 1974, every cabinet member of the coalition government was in office at his/her department as agreed. On May 24, 1974 the Joint Political Committee (JPC) voted to accept the draft 18 provisions as parts of the national policy. Early that year, in Cambodia, the Lon Nol government and its armed forces fell completely in the hands of the Khmer Rouge. Lon Nol had to immigrate to Thailand and from there to the USA, where he died shortly afterwards. The composition of that 15th Coalition Lao Government, which consisted Neo Lao Hat Xath (NLH) and Vientiane (VTE) members, is shown below. Touby Lyfoung (VTE) Vice-Minister of Post-Office and Telecom. Soth Phet-rasy (NLH)(7) Minister of Economy and Planning. Photo #170. 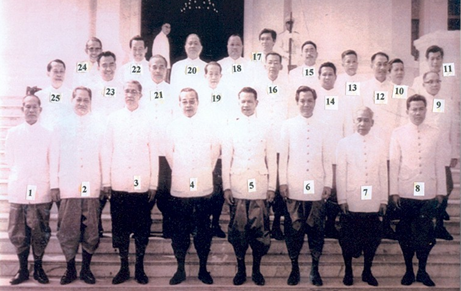 Members of the two-faction Lao Coalition Government. (Numbers from 1 to 25 refer to the list provided above). (4) Col. Deuane Sounnalath forced Gen. Kong Le out of the Plain of Jars. He was the Commander of the 2nd Parachutist Battalion who helped Gen. Vang Pao and French troops push the Viet-Minh toward Nong Het; was injured at Ban Phounong, Xieng Khouang. He was a pro-NLH neutralist. (7) Soth Phet-Rasy, Co-President of 21-Gang Organization. The list of the members of the Joint Political Committee is shown below in a numbering order that matches the line up in Photo #169. Souvan Sananikhom; 2. Bounthan; 3. Vannavong Lescure; 4. Taio Sisoumang Sisaleum-Sack; 5. Tiao Souphanouvong; 6. Khamsouk Keola; 7. Gen. Kham-Ouan Rattikoun; 8. Chao Sinh Sinhthavong; 9. Unknown; 10. Ee Pottaphany; 11. Khamfanh Nouangsavanh; 12. Unknown; 13. Khamla Kingsada; 14. Foung Lo; 15. Unknown; 16. Unknown; 17. Gen. Houmphan Norasing; 18. Unknown; 19. Unknown; 20. Phom Bounlutay; 21. Unkown; 22. Pha Vongsay; 23. Unknown; 24. Ms. Phaiboun Pholsena; 25. Ms. Khamsouk Vongvichit; 26. Bounteng Insisiengmai; 27. Khamphan Simmalavong; 28. Yang Dao; 29. Unkown; 30. Khamleck Saignasith; 31. Vongsavanh Boutsavath; 32. Heng Saythavi; 33. Boun-Nak Souvannavong; 34. Salath Rajasak; 35. Houmpheng Soukhaseum; 36. Khampheng Saignasith; 37. Saisavang Chanthepa; 38. Viboun Abhay; 39. Siharath Phasouk; 40. Khamphan Mahachan; 41. Bouasy Sopha. The list shown below is based on party affiliation of the members of the Joint Political Party. Photo #171. Members of the Joint Political Committee (numbered from 1 to 41 per the list above). June 3, 1974 was the day the last families of US military agents left Laos. August 1974 was the month anti-Vientiane government demonstrations were held by the members of the 21-Gang Organization. On April 30, 1975 South-Vietnam completely fell in the hands of the North-Vietnamese communists, forcing several million of South-Vietnamese to flee to other countries like Thailand, Indonesia and The Philippines. During their exodus, many of them ran into all kinds of extremely pitiful and regrettable dangers, including shipwrecks, armed robberies, rapes, deprivation, etc. Some of them even got killed or tortured inside and outside the country. South-Vietnamese deaths included over 254,300 who were killed in the battlefields, over 200,000 who died during the exodus, and about half a million of civilians who were tortured and killed by the North-Vietnamese communists. In February 1975 the combined Neo Lao Hak Xat and North-Vietnamese forces more and more heavily attacked all the military strongholds of the Vientiane rightist army, in violation of all the signed agreements. In March 1975, North-Vietnamese troops equipped with tanks, heavy weapons and anti-aircraft artillery attacked rightist positions along Highway 7 from the Plain of Jars to Highway 13 at Sala Phou Khoune. They captured the command center of MR-II’s second division and headed toward the city of Vientiane. On April 9, 1975 Gen. Vang Pao sought an audience with Prince Souvanna Phouma, Prime Minister of the Coalition Government, to consult with him about the increasingly stronger and more dreadful attacks that were taking place. He did not get any meaningful answer and had to return to Long Cheng empty-handed and disappointed. On April 11, 1975 Gen. Vang Pao went to seek advice from H.M. King Savang Vatthana and met with the same disappointing results. On April 13, 1975 the Lao People’s Democratic Republic (Lao PDR) dissolved the National Assembly and announced new general national elections. The political situation worsened after the Lao PDR forces, supported by the fully armed North-Vietnamese troops, captured the rightist limitary camps of Kasy and Vang Vieng. In May 1975, students, civil servants and members of the public led by the “21-Gang Organization” held loud demonstrations denouncing and calling for the resignation of the Vientiane rightist government. On May 14, 1975 the Neo Lao Hak Xat forces, combined with the North-Vietnamese troops, took over the entire military command center of MR-II. At that time, Gen. Vang Pao and his military commanders and their families had already left for the refugee camp of Nam Phong, Khon Kaen Province, Thailand. That same day, the entire USAID compound in Nahaidieo, Vientiane was destroyed by the 21-Gang Organization demonstrators. During 21-30 May 1975, those demonstrators negotiated the cut in US assistance with the US Embassy. They left the compound after an agreement was reached on May 30, 1975. On July 7, 1975 the first fight between Thai and Lao PDR forces occurred on the Mekong River, upstream from Ban Sithan Tay. The next day, Royal Lao Army officers and rightist high-ranking policemen and civil servants were lured into attending a meeting at the Chinaimo Military Camp in Vientiane. Several thousand of them were later sent to the re-education camp (Jail) of Vieng Xay, Houaphan Province. In August 1975 Gen. Kham-Ouan Boupha, a pro-Red communist vice-Minister of Defense, ordered his troops to seize power in Vientiane and all the Lao provinces. On August 23, 1975 the Lao communists indeed seized full power in the city of Vientiane. High-ranking civil servants, military officers and policemen were lured into the re-education camp of Vieng Xay, Houaphan Province where they were left to suffer from mental and physical abuses, hunger, poisoning, manslaughter, and medical mistreatment. In volunteering for a re-education program, those Vientiane rightist volunteer-detainees acted out of selflessness and honesty toward their country. But in the end, they were misled by the communists, as part of a secret plan formulated by Kaysone Phomvihane and Gen. Kham-Ouan Boupha, who faithfully implemented the Indochina Communist Party’s strategy to reshape the mind of all the Lao ethnic groups. This was within their overall goal to occupy Laos and get rid of all the Lao rightists in an extremely inhumane and barbarous way –a tactic that deserves to be fully documented and recorded as a lesson learned. All those of us who have survived the ordeal ought to remember the sacrifices made by those courageous individuals deep in our hearts. May their soul and spirit rest in peace! Photo #172. 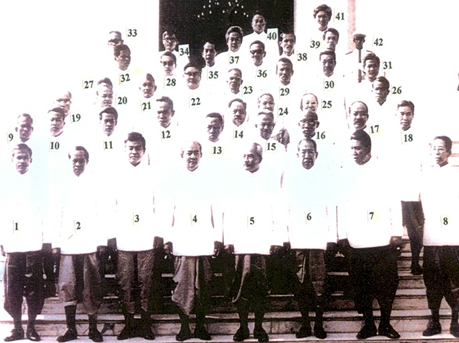 Top row: people sentenced to death by the Laos PDR included Phoui Sananikone, Tiao Boun-Oum, Gen. Vang Pao, Gen. Kouprasith Abhay, Gen. Oudone Sananikone, Gen. Thonglith Chokbengboun. Bottom row: people sentenced to life terms included Gen. Silack Pathammavong, Gen. Ai-Tam Singvongsa, H.E. Sisouk Nachampasak, H.E. Ngone Sananikone and Sopsaysana Southakakoumane. During November 5-13, 1975 elections were held to elect regional representatives to serve as Lao PDR advisors. (Those elected appeared to be mostly former guerilla fighters with limited education. It was not clear in which advisory capacity they would be able to serve). This was actually part of a plan to elect communist Vietnamese and have them monitor the situation in Laos, looking for an excuse to send people to slow death re-education camps and make more room for Vietnamese to step in. On November 17, 1975 the Laos-Thailand border was closed. During November 20-23, 1975 Lao communists elected district and provincial administrators to expand the management circle, relying mostly on members of the Indochina Communist Party to fill all Lao PDR managerial positions in order to keep Laos for good. On November 28, 1975 the Lao Communist Party announced the dissolution of the democratic regime and changed it to the Lao PDR, moving from monarchy to communism. During December 1-2, 1975 the leaders of the Lao Communist Party met in secret to develop plans to (1) dissolve the third coalition government led by Prince Souvanna Phouma as Prime Minister, (2) accept the abdication of King Sri Savang Vatthana, and (3) proclaim the formation of the Lao People’s Democratic Republic, (LPDR). On January 1, 1976 Thailand reopened its border at two locations to be used as entry and exit points. Border violators were subject to death penalty or jail detention. In January and February 1975, Kaysone Phomvihane was getting his orders from the Indochina Communist Party in Hanoi, North-Vietnam in performing his duties in Laos. In May 1976, the LPDR met to formulate action plan to implement the Indochina Communist Party’s instructions pertaining to Laos. These included arresting thousands of rightist leaders and civil servants who did not observe communist principles, and subjecting them to brain-wash and additional grass-root training. Some of the detainees were able to come home, partially disabled. Most of them never got home and just disappeared without their families ever knowing what really happened to them. In February 1976, the US started admitting Lao refugees from the Soune Vinay camp to the USA. The first batch of refugees consisted of Lao individuals who used to work for a US agency like USAID, and/or served as language interpreters for the US during the war. The second batch consisted of Lao Christian refugee families sponsored by the US Christian organizations. The last batch was filled by military officers and soldiers who used to fight the communists alongside the US. In July 1976, a severe drought in Laos drastically reduced rice harvest and other agricultural products. This weather condition has never been experienced before and caused severe public hardship. On March 1, 1977 Lao Theung revolutionary Communist leader and Indochina Communist Party member Sithon Kommadan died of old age in Laos. Earlier that year, anti-Communist Government guerillas made their appearance near the city of Louang Prabang. The Lao communists surrounded the residence of former King Sisavang Vatthana, arrested him and his family, and sent them to an underground jail in Vieng Xay, Houaphan Province. During March 19-20, 1977 the US sent in their first Missing in Action (MIA) Team for an inspection trip to Laos. In July 1977, a second year of drought continued to drastically reduce rice harvest and further exacerbated public hardship. On July 18, 1977 Kaysone Phomvihane and Leduan, Secretary-General of the North-Vietnam Communist Party, agreed to sign a binding Laos-Vietnam friendship treaty that allowed Communist Vietnam to protect (and indirectly control) Laos for a 25 year term. The agreement may be extended for 10-year terms if agreed to by both parties. For all practical purposes, this was a life-long, no time agreement. As a result, Lao PDR had no need to maintain an army –just police teams and local security guards equipped only with AK 47 guns with a 25 yard shooting range and police handguns. The Lao communists had to give up everything to North-Vietnam and let them issue orders approved by the Indochina Communist Party. North-Vietnam is the de facto boss of Laos and Cambodia because we owe North-Vietnam a blood debt. The special friendship and cooperation treaty between the Laos and North-Vietnamese Communists, represented respectively by LPDR Party’s Secretary-General Kaysone Phomvihane and Vietnam Communist Party’s Secretary-General Leduan, was signed on July 18, 1977. It called for a 25-year term that can be renewed for unlimited, consecutive 10-year terms if agreed to by both parties. For all practical purposes, this is an endless treaty that is highly disadvantageous to Laos because everything is now deceptively under Viet-Nam’s control. The following paragraphs contain an unofficial translation of the treaty. We agreed that independence, autonomy and legitimate leadership of the LPDR and Vietnam Communist Party, should form the basis for our two countries’ common efforts in fighting imperialism and strengthening the special relationship between LPDR and Vietnam. Article 1 – The two parties agreed to make every effort to protect and expand the special relationship between Lao PDR and Vietnam, and will keep improving mutual confidence, long-term cooperation and assistance in all areas based on modern principles of ownership and equity; respect for independence, democracy, full territorial integrity, legitimate national interests, non-interferences in internal affairs; and make every effort to teach their party memberships, their armed forces, and their population to preserve and enhance the special relationship between Lao PDR and Vietnam, and to maintain it as a transparent and durable process. Article 2 – Based on the understanding that the protection of national independence and the maintenance of national security are the sole responsibility of the country involved, the two parties promise to provide with utmost sincerity the mutual support and assistance needed to increase each country’s capabilities to protect and maintain independence, democracy and complete territorial integrity, and protect the freedom of the work force from any tactics and dangerous actions perpetrated by imperialists and foreign trouble-makers. Article 3 – As a means to facilitate mutual assistance, minimize potential problems, set the basis for full-fledge natural resources development, strengthen the country’s infrastructure, improve permanent living conditions, the two countries will have to improve their cooperation as needed in modern society in order to reap mutual benefits in industry, forestry, agriculture, transportation, natural resources exploitation, regional economy, technology, etc. and do so with utmost sincerety. The two countries must help each other in training its labor force; exchanging experts in economics, culture, scientific fields; cooperating with each other in arts, education, health systems, news media —newspapers, radio, television, movie, gymnastics, and various fields of culture. Both sides have agreed to increase the frequency of professional meetings in disciplinary areas of interest to the two countries in order to discuss joint action programs and to exchange lessons learned in construction, economics, and cultures. Article 4 – Both countries have decided to build the boundary line between Laos PDR and Vietnam as a long-lasting friendship boundary between two friendly countries in compliance with the Lao PDR -Vietnam treaty signed on July 18, 1977. Article 5 – Both sides must respect and duly support the integrity of both countries. Both sides must come together to join forces with other communist countries to improve cooperation and mutual assistance in compliance with the Marx-Lenin doctrine and Proletarian Internationalism. Both sides must continually improve long-term cooperation and mutual assistance with Cambodia as a sister country, and based on full fairness, respect for independence, democratie and territorial integrity. The two sides must support southeast-Asian countries in maintaining their independence, freedom and cooperation with other countries in this part of the world. We must respect their independence, democratie, territorial integrity, avoid interference in their internal affairs, respect their equal rights, and look for fair and equitable mutual benefits. The two countries must support the fight of the people in Asia, Africa, and Latin America against imperialism, discrimination in order to maintain their independence, democracy, and social progress. Both sides must support labor unions and the labor force in capitalist countries in order to protect their democratic rights and social progress. Both sides must show we would do everything in our power to fulfill our duties and join in the global fight for democracy, national independence and socialism. Article 6 – Both countries must be able to fairly exchange their opinions and points of view on matters of interest to the two countries and on various contemporary issues of mutual interest. This should be done through meetings between the leaders of the two countries, and/or official visits by national representatives, special envoys, or through diplomatic channels. Both sides will widen the cooperation between public organizations of both countries. Any issues related to the relationships between the two countries will be resolved through open and sincere negotiations in a frank and mutually respectable context. Article 7 – This treaty will be effective from the day it is signed. The exchange of the signed documents will take place in Hanoi, the capital city of the Republic Democratic of Vietnam as soon as practical. This treaty is valid for twenty-five (25) years and will be self-renewed for consecutive ten (10) year terms as long as one of the two parties involved does not express its desire to abolish the treaty to the other party in writing at least one year before its expiration date. This treaty was prepared in Vientiane, the capital city of the Lao People’s Democratic Republic on July 18, 1977 in two documents: one in Lao and the other, in Vietnamese. Both the Lao and the Vietnamese versions are of equal value. In 1978, the situation in Indochina became very intense because Soviet Russia lent their hands to help North-Vietnam attack southeast-Asia, causing China’s great concern about south-China’s security. This created the fight between China and Viet-Nam in 1979. Mainland China deployed several army divisions to attack North-Vietnam along their common borderline. The fighting spread almost as far as Hanoi, forcing North-Vietnam to recall several of their divisions back from their rear positions in Thailand, Cambodia and Laos in order to beef up their armed forces in North-Vietnam.